I'm starting to put together some ideas on how I would like Ethan's room to come together. I'm really drawn to graphic prints with a touch of whimsical fun...while of course, being masculine. The centerpiece of his room will be the bed...and choosing a bed for a boy is hard. I'm most drawn to the above bed and the Jenny Lind bed. We plan to stop by Land of Nod later this month to check them out in person and hopefully bring "the one" home. I feel like once we have the bed, that will force us to clean out the guest bedroom and finally start to put his room together. Don't even get me started on transitioning him from a crib to a twin bed. I can't even imagine what fun we have in store there! I plan to move his existing curtains to the new room, as well as some of the art. You'll notice the fun tea towel artwork above. The Hell Yeah is super fun, but sold out. You can see how it was styled in this little boy's room here. And I actually think the Ba Ba Bonkers version is more appropriate for his room anyway...need to get it before it's gone! Last, I want a place for him to play and display his books. I definitely want to include some built-in book ledges and his teepee so he can lounge around and read. I'm not sure if I'll include a rug in his room...there may be enough already going on. OH and the winner was chosen for the digital print. Was it you? I'm liking the mix of the wood with the black and white! 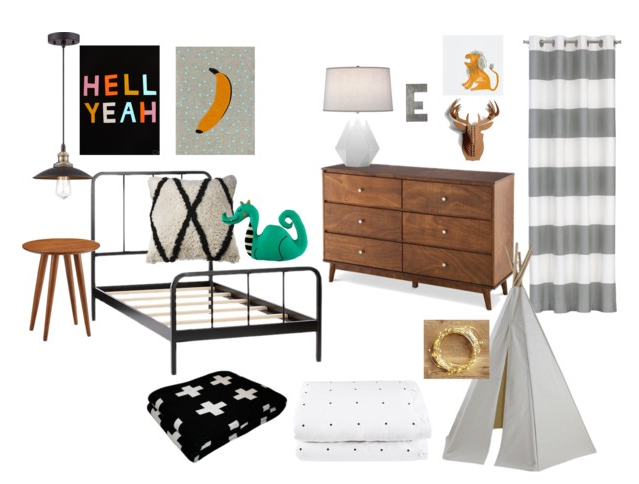 It's fun designing a little (I mean big) boy's room! Thanks...I love incorporating the natural elements in like wood-tones. I love everything about this room! Hell yeah!!! The pendant, the bed, the animals...and the teepee, of course! I can't wait to see it come to life!! Same here...now to actually make it happen! Love the mood board. I think you should go with the Jenny LInd though - I feel like it is more of a long term piece (I just bought two vintage ones that are probably 60 years old and are still going strong). Can't really go wrong with either bed though! You've definitely got me leaning in that direction! This is so cute! I love the bed you chose (and we have a jenny lind crib so I'm a fan of that one too!) you have such a great eye. Can't wait to see it come together and how you plan on changing up his nursery room for the new little one!! I mean, I can't wait to see what you do with his big boy room AND baby #2's nursery. And of course I am obsessed with the twinkle lights. I love this!!! I want to get my boys teepees! We have those pop up tents and those things drive me crazy as they are being moved around the house all the time. Don't stress too much about the big boy bed. We moved our oldest to a full size bed when he was 21 months old. Best decision ever!!!! He was never a good sleeper in his crib but in a big bed, he sleeps like a rock. He just needed room to sprawl! He's only gotten out of bed once and he's 3 now. That may be because we hooked up our Angelcare movement monitor and told him it would beep if he got out of bed. ;) whatever works right? Oh gosh... the bed transition. I'm holding out as long as possible because I... enjoy my sleep :) and feel like none of us will get any once we transition! Love your board. I feel like once you make the transition from crib to bed it actually goes smoother than expected. It's just that first step!